The London Borough of Enfield has successfully achieved certification against the code of practice for their public space town centre scheme. The Surveillance Camera Commissioner’s third party certification scheme enables organisations to clearly demonstrate that they comply with the surveillance camera code of practice. This case study looks at London Borough of Enfield’s journey through the certification process. The Surveillance Camera Commissioner’s third party certification scheme enables organisations to clearly demonstrate that they comply with the surveillance camera code of practice. For relevant authorities such as Local Authorities and Police Forces this is particularly important, as they must show due regard to the code – certification enables them to demonstrate this to the public. I applied to be audited against the commissioner’s certification scheme because I wanted our control centre to be able to show the public and potential clients that our performance is independently measured, and meets the 12 guiding principles in the code. Certification is simple, accessible and affordable and there are 2 security industry certification bodies that are currently qualified to audit against the code of practice – the SSAIB and NSI. There are 2 steps to certification. The first step, desktop certification, is aimed at organisations that are working hard to achieve full compliance with the code but are aware that they may need more time to become fully compliant. The second step, full certification, is for organisations that are close to or fully compliant with the code. 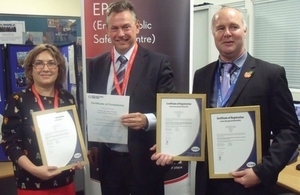 Enfield are certified against step 2. Full Surveillance Camera Commissioner certification lasts for 5 years and it enables organisations to demonstrate to communities that they use their CCTV systems transparently, effectively and proportionately. Successful organisations will receive a certificate and be able to display the commissioner’s certification mark one their website and other publicity materials. The problem with poor take-up of previous standards for CCTV has been because there were too many standards. Most were not applicable or appeared not relevant in terms of their requirements to the way public CCTV systems operated so were ignored in the past by most. Now relevant authorities have the surveillance camera code of practice to have legal “due regard to” it is essential to also consider and evaluate, preferably independently, that your system is performing and operating to principles in the code. Hence we took the opportunity to be certified against the code – the cost is negligible for the commissioner’s certification assessment. Visit the commissioner’s certification page to find out how you can have your scheme certified against the surveillance camera code of practice.